Dry eyes is a chronic condition that can be a simple or much more complex cause of significant discomfort and have a severe impact on quality of life and vision. Diagnosis of the causes of the condition needs to be tackled systematically with a comprehensive evaluation of environment, ocular history and systemic health. Over 16 million people in the United States suffer from chronic dry eye disease. This video portrays the every day life of someone struggling with this condition and what they can do about it. Start with us to find the root cause and treat the problem, not just the symptoms. Our doctors are able to treat and manage evaporative dry eye diseases that account for 86% of all dry eye conditions. About 80% of dry eyes is caused by the lack of an important oil found in the tears. The oil comes from small oil glands found in your upper and lower eye lids, called meibomian glands. 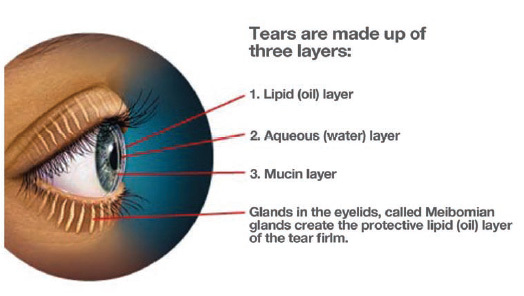 These glands can become blocked preventing the oil coat your tears every time you blink. When you don't have enough oil in your tears you may feel burning, scratchy and irritated eyes because they are evaporating too quickly. Our doctors are able to treat and manage evaporative dry eye diseases that account for over 80% of all dry eye conditions. Treatment options include both home and in-office therapies to provide significant results in patients that have suffered chronically from dry eyes. To address the source of dry eyes in the eyelids we use two unique procedures called the MiboThermoflo and LidPro Debridement. Along with the daily home therapy, we have been able to address dry eye issues rapidly providing significant relief.